Brazil says the rate of deforestation in the Amazon increased by 28% between August 2012 and last July, after years of decline. 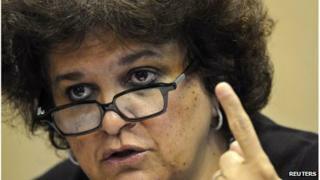 The government is working to reverse this "crime", Environment Minister Izabella Teixeira said. Activists have blamed the increase in destruction on a controversial reform to Brazil's forest protection law. Last year Brazil reported the lowest rate of deforestation in the Amazon since monitoring began. The provisional statistics from August 2012 to last July suggest that the area suffering deforestation was 5,843 sq km (2,255 sq miles), compared to 4,571 sq km (1,765 sq miles) in the previous 12 months. The 28% rise interrupts a period of declining deforestation which began in 2009. However, it still remains the second lowest annual figure for forest loss in absolute terms. The worst year on record was 2004, when 27,000 sq km of forest was destroyed. Monthly data from several scientific institutions had suggested the deforestation rate might be on the rise. Environmentalists say the controversial reform of the forest protection law in 2012 is to blame for the upwards trend in Brazil. The changes reduced protected areas in farms and declared an amnesty for areas destroyed before 2008. The reform, a long-standing demand of the country's farmers' lobby, known as the ruralists, was passed after several vetoes by President Dilma Rousseff. Agriculture accounts for more than 5% of the Brazilian GDP. "If you sleep with the ruralist lobby, you wake up with deforestation," Amazon expert Paulo Adario from Greenpeace wrote on Twitter. Ms Teixeira said the destruction rate was "unacceptable" but denied President Dilma Rousseff's administration were to blame. "This swing is not related to any federal government fund cuts for law enforcement," she told reporters, adding that around 4,000 criminal actions have been taken against deforesters in the past year. As soon as she returns from Poland, where she is representing Brazil at the United Nations summit on climate change, Ms Teixeira said she would set up a meeting with local governors and mayors of the worst hit areas to discuss strategies to revert the trend. The majority of Brazil's greenhouse gas emissions, believed to be one of the main causes of global warming, stem from deforestation. The Brazilian government made a commitment in 2009 to reduce deforestation in the Amazon by 80% by the year 2020, in relation to the average between 1996 and 2005. A new interactive online map, created by the University of Maryland, shows areas of global forest loss and gain from 2000 to 2012. Brazil showed the best improvement of any country, cutting its deforestation rate in half in the period 2000-2012, from approximately 40,000 sq km per year to approximately 20,000 sq km per year. But overall the planet saw a net loss of of 1.5 million sq km of forest - an area the size of Mongolia.